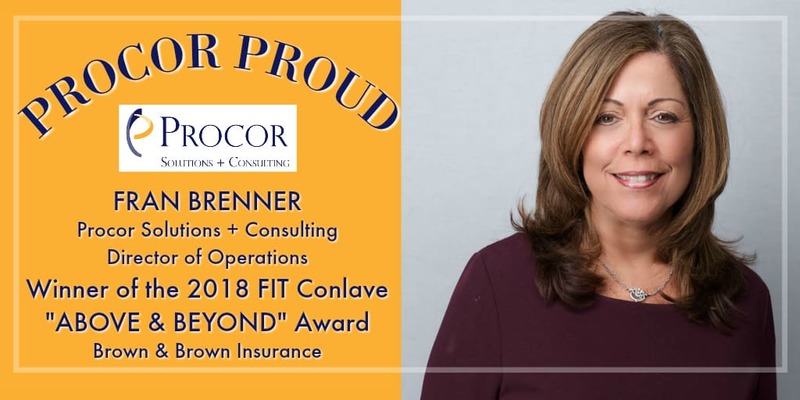 At this year’s Brown & Brown FIT Conclave in Orlando, Florida, Procor’s Director of Operations, Fran Brenner was honored with the “Above and Beyond” Award. The 2018 FIT Conclave was a wonderful event that recognized select teammates coast to coast from for their important contributions towards professional growth, business development and overall success of the company. Mrs. Brenner has been with Procor Solutions + Consulting for 5 years, during which time she has proved herself to be a committed firm advocate and valuable asset to our team and to many of our clients. Procor President, Arnie Mascali pays tribute to Fran below. “Fran Brenner is the ultimate team player. Her teammates affectionately refer to her as the “OG” because she is one of the original core members who helped in the early success and growth of Procor. And after nearly 6 years she has become an integral part of our team. Fran always strives to “get stuff done” and is ready and willing to jump in to help a teammate or client navigate through issues. During the 2017 Hurricane Season Fran worked tirelessly to organize Procor’s on-site response for our clients, while still tending to her day-to-day responsibilities in our accounting and operations group. She even took phone calls from employees of our clients who were impacted by the storms and didn’t know where to turn for help. That is WAY Above and Beyond!